Founding members Jim Kerr (vocals) and Charlie Burchill (guitar, keyboards), along with drummer Mel Gaynor, are the core of the band, which currently features Andy Gillespie on keyboards and Ged Grimes on bass guitar. 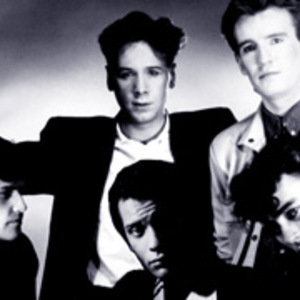 Formed in late 1977 from the ashes of Johnny & the Self-Abusers, Simple Minds initially signed to Arista who recorded and released their first three albums. The musical changes Simple Minds went through in these first three albums shows how diverse their song range is. Tracks to compare would be Chelsea Girl, their first single with hints of Johnny And The Self Abusers, and I Travel an almost disco sounding track. Virgin Records saw the potential in the band and in 1981 signed them up. The first Virgin Records release Sons And Fascination/Sister Feelings Call was a double album, but later released as two single albums - Sons and Fascination and Sister Feelings Call. They first found noteable success with New Gold Dream (81-82-83-84), which is still regarded as their best album by some fans. They have had great commercial success in Europe and across the world since then (in the 80s and early 90s they sold 30 million albums worldwide). In the United States, however, they are known primarily for Don't You (Forget About Me) which was used in the soundtrack to the film the breakfast club and went to number one. Ironically it is one of few songs recorded by the band that they didn't write themselves. In 1985 Once Upon A Time yielded a string of worldwide hit singles, (Alive And Kicking, Sanctify Yourself and Ghostdancing) leading to playing bigger arenas and supporting Amnesty International with donations from record sales. Jim Kerr and Charlie Burchill remain the core of the band to this day, with Andy Gillespie (keyboards), Mel Gaynor (drums) and Eddie Duffy (bass) supporting. Other members of the band: Michael MacNeil (keyboards), Derek Forbes (Bass) and John Giblin (Bass). They have maintained a strong fan base world-wide and their album Black and White 050505 received critical acclaim on its release in September 2005, although it did not secure a release in the United States. The band embarked on a UK-wide arena tour towards the end of 2008 to celebrate 30 years. This was cosidered a great success. Their new album Graffiti Soul is to be released on 25 May 2009. Jim Kerr was married to Chrissie Hynde of the Pretenders in 1984 (divorced 1992). They have one child, Yasmin Paris Kerr (1985). He was subsequently married to actress Patsy Kensit in 1992 (divorced, 1996) with whom he had a son, James Kerr (born, 1993).